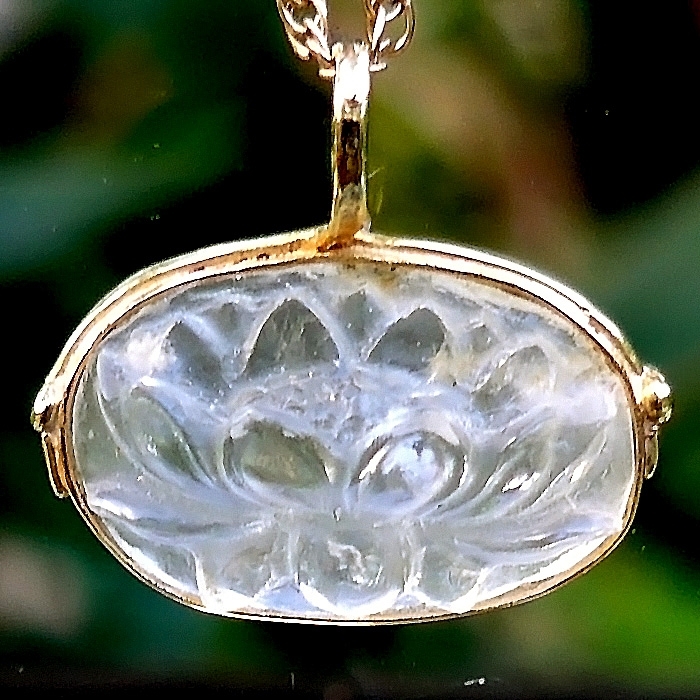 Dimensions (HxWxD): .75" x 1.7" x .3"
This gorgeous museum quality 1.7 inch wide Burmese Moonstone Lotus Pendant, weighing 1.7 grams, or 8.5 carats, is .75 inches high. This pendant features a bas-relief of a gorgeous lotus flower in full bloom. This pendant was carved with loving care from a single large highly luminous gemstone and set in an 18 karat gold bezel setting by Pedro, a world-renowned artist, jeweler and shamanic practitioner, who resides in Tokyo, Japan. The luminous bluish-pink chatoyancy can be viewed from many angles to appreciate its mysterious subtle hues! Moonstone activates the throat chakra, enhancing our ability to communicate our own individual truth to others, and puts us in touch with the cycles of birth, growth, death and renewal that propel the seasonal cycles experienced on planet Earth and the varied life cycles of plants and animals, planets and stars. 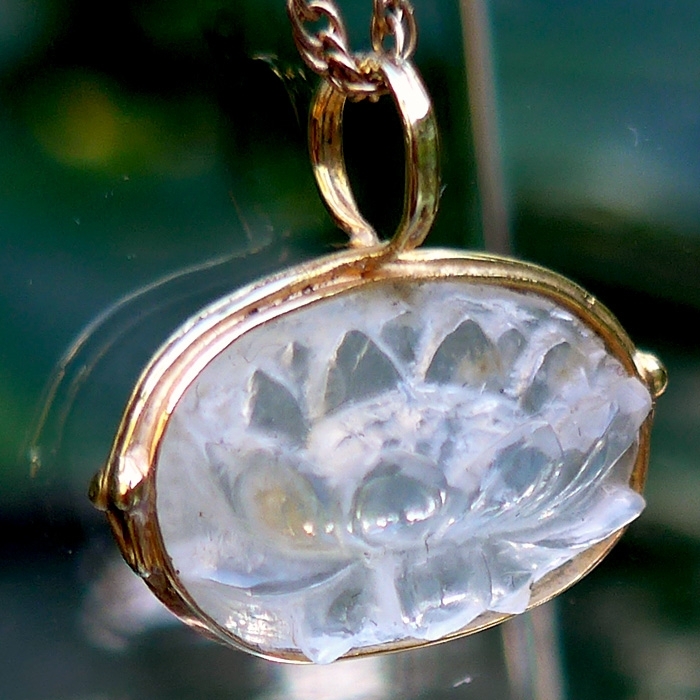 Pedro selected gemstone quality Moonstone for his gorgeous rendering of the sacred Lotus flower because the unusual daily life cycle of the lotus flower is analogous to the monthly cycle of the Moon. Each day the lotus flower blossoms on the surface of the water, and each night the flower disappears below the surface of often murky waters of inland waterways, only to re-emerge the next morning in its pristine radiance. 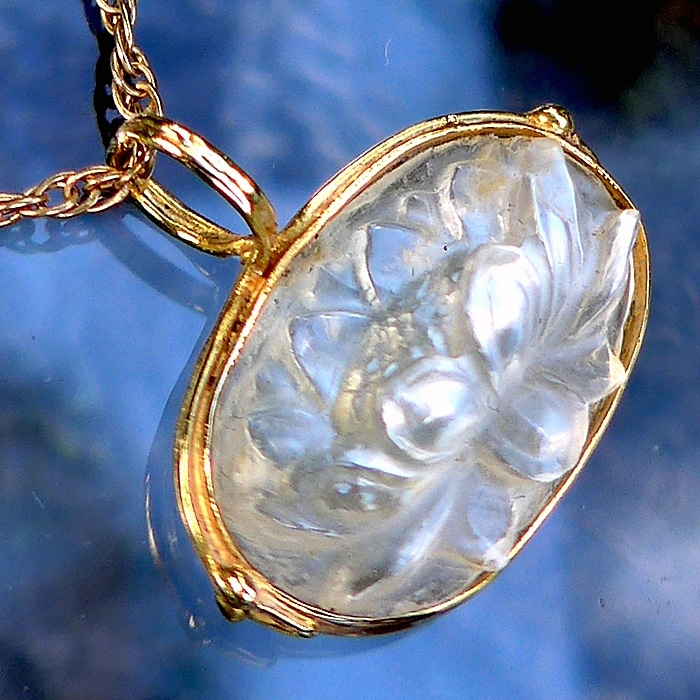 The visible hues in this gorgeous moonstone Lotus pendant are white, pink, and pale blue. Many in the Middle East view these as the colors of royalty and comfort, and of course, the colors associated with the Egyptian Goddess Isis, Mistress of Magical Healing and Goddess of the Moon. The gemstones associated with Isis are pearl, coral, lapis, geodes, and moonstone. Wearing jewelry with these stones is a partcularly effective way to bring the goddess near. Use the goddess fragrances of myrrh, rose, iris, and eucalyptus on your person, in your home or at your office to increase your resonance with the Lady Isis and increase your access to her energy of Divine Love. 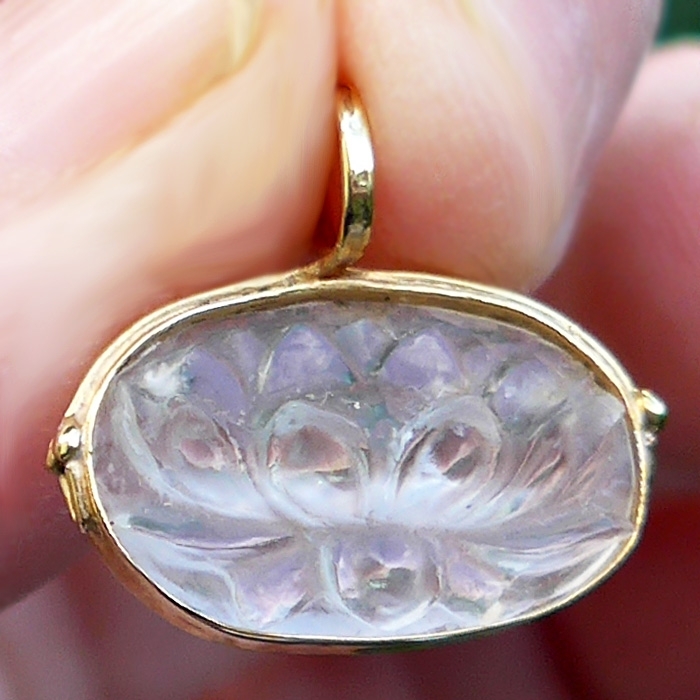 This Moonstone Lotus pendant has a bluish pink shimmering reflective sheen that gemologists call "blue adularescence." This means that the Moonstone shines with a spectral lustre that flashes blue in different lights, or as the gemstone is rotated in the line of sight. Moonstone connects the bearer with the natural cycles of the body, and of the natural world in a way that energizes and heals, rejuvenating the body, and aiding in the treatment of degenerative conditions of all kinds. Gemstone quality Moonstone like this gorgeous Moonstone Lotus Pendant provides a feeling of energetic and emotional expansiveness, giving the bearer a developing feeling of the possibilities in life, the potential for accelerated spiritual growth and increased love and light -- and this expansive emotional state resolves into feelings of harmony and joy. Above weight is shipping weight. Net weight is 1.7 grams.